The post where you all go "Eurgh!" If you are related to me, or don't want to hear about the female reproductive cycle then please look at this picture and then go and read this post about Why Daddys Are Always (Never) Right. Forget you were even at this post. A while back now I was trying to work out how I could cut down the cost of our monthly bills. 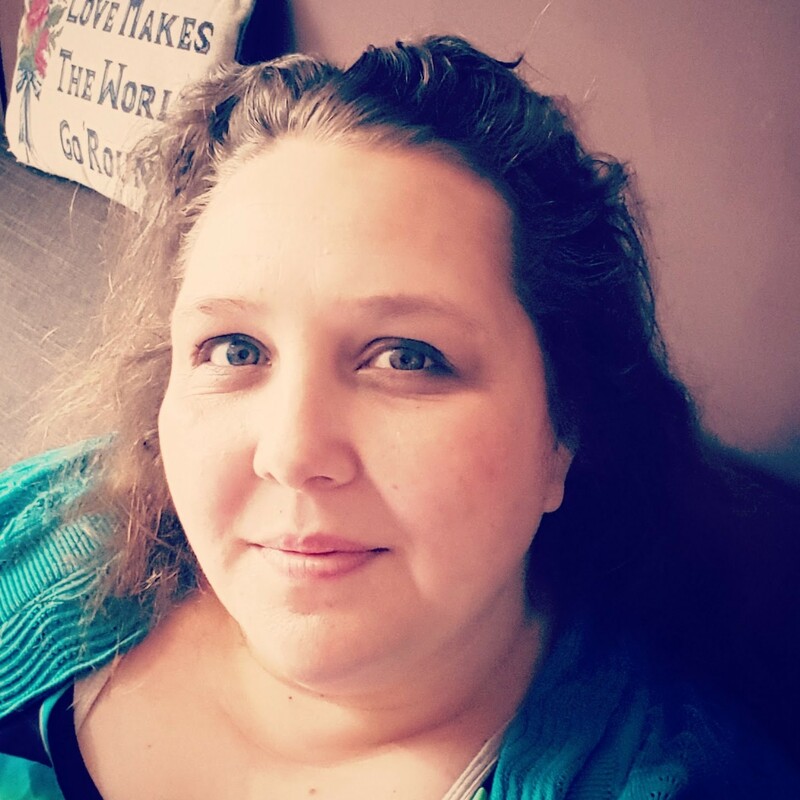 I have a few posts on the blog about being frugal but the one area that I felt I could cut down on the most was personal items. I suffer from Menorrhagia (really heavy periods) and always have done and was looking on the Internet for some ideas because the monthly bill for sanitary products was starting to make me wonder if being pregnant all the time or having a hysterectomy would be the only solutions. Somewhere I read about Mooncups. The thought didn't actually make me go "Eurgh!" as it does to some people, but it did remind me of a story I had heard many years ago about a woman who used her menses to fertilise her roses (that did make me go Eurgh) but I figured that a £20 one off payment would actually save me if I used it for more than three periods (that was how much I would spend on sanitary products for two months) so I went to my local boots and brought one. They sell them in two sizes depending on your age and if you have ever had a vaginal birth. I got size A not the small size B and went home excited with my package, even if slightly worried what Daddy was going to say. You need to sterilise the cup first and so I set about doing that. I was wondering what the heck anyone would think if they walked into my kitchen and saw me boiling a plastic funnel like object in a new saucepan but I carried on. I played with it after it had cooled down trying to fold it as I would need to to insert it and found it to be a lot more flexible than I had thought it would be. Finally came the time for me to use it for the first time. I followed the instructions in the very detailed leaflet and put it in. I knew that I hadn't put it in right so I removed it and tried again. Second time lucky it got in the right spot. It made me giggle because in order to put it in you kind of fold it in on itself and then when it is inside you it pops open and I didn't think I would feel the pop as clearly as I did! I managed to wear it for about twenty minutes before the stem was really annoying me and so I had to remove it to cut the stem down a bit (which it says you can do in the leaflet) and at the same time I was able to see how much of the menses it had collected. I emptied it into the toilet and gave it a quick rinse under the tap before inserting it again. This time it went into place straight away. It took a few days for me to get use to using the cup, but the one thing that it didn't do which I would normally have a problem with is leak. In the past I would have to wear a tampon and a towel in order to feel protected but the Mooncup was handling the heaviest of periods. It was when we went to Sweden on Stage on July 4th, that I realised what a great piece of equipment this was. It was a hot day, I was on the first day of my period and there were only going to be portaloos to use. For the entire time that we were there I emptied my cup once, just because I thought I should. It was quick it was private and best of all I didn't have to carry around tampons or towels or spend hours in the queue for the toilets! This was the only picture of me that I could find from that day that didn't involve me dancing with abandon. I would recommend a mooncup to anyone female. 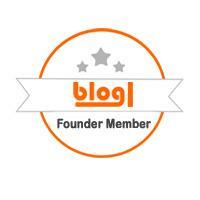 I think that it is great for saving money, time and the environment. Sure it sounds gross and the sucky noise that you sometimes here when removing it isn't my favourite sound but it helps me see just what I am losing each month and you know that horrid dry feeling you sometimes get when taking out a tampon? I've not had that since using a mooncup! Every morning Baby Boy and Top Ender have fruit after breakfast. Today for some unknown reason Top Ender took less time to eat hers than Baby Boy. Baby Boy noticed that Top Enders bowl was empty and passed a piece of his melon to Top Ender. "Oh yes please Baby Boy!" Over at Mediocre Mum I've been tagged in meme.... Now I don't want you thinking that just because I am doing this meme quicker than some of the others that I have been tagged in that my mind is in the gutter or that I love Mediocre Mum more than you because it just isn't true. What is true though is that I can name five fictional characters that I would like to erm... be friends with without having to think about it. I can actually name ten. You know that game where you are allowed to have guilt free erm friendship with a list of fantasy people if they should ever come knocking at the door? Yeah, I also play the what about if you were a fictional character game too. 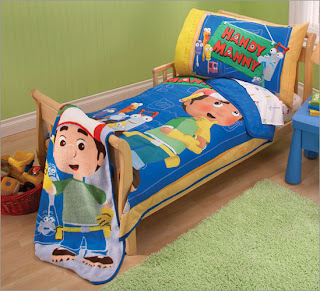 Why Handy Manny? Well not because he thinks that talking tools (No real tools like Hammers and stuff not *his* tool) is normal, or because he has a robot dog. Not because he speaks Spanish and English, can play the guitar or because he never pays for anything or is ever paid for jobs. Actually it is just to mess with Kelly who obviously has a thing for him. In fact to really mess with her I would ask Elliot (her brother) if he wanted to join us. The Tools would not be invited. And its pretty much the same story with Bob the Builder. Well he does invoice people at least (as he always has a lot of paperwork in his office) it would just really make Wendy jealous. Instead of asking her brother (does she have a brother?) I would ask Bob's twin brother Tom to join us. Again the talking machinery wouldn't be invited. Nor would Spud or Pilchard, but maybe their Dad as he is quite sweet. 4.Severus Snape and Gregory House. I have a thing for men with long hair. And for men who are magic. And for Alan Rickman look-a-likes. And for men that are mean. That is why I also like House. Also he is clever. 3. 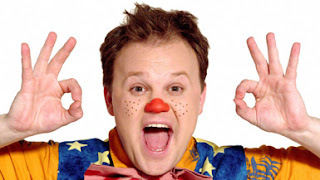 Mr Tumble. Technically I would want it to be Justin but as we can't have real people it shall have to be him. I just want to be taught how to sign rude words. Can you sign that's the spot? 2. The Wiggles. Yes all of them. Actually not Jeff because he falls asleep all the time and getting friendly with someone who was snoring just wouldn't be fun. Oh and Captain Feathersword would be included, but Henry, Wags and Dorothy wouldn't. I can hear you all sneering, but think about it, have you seen them live? They are an energetic bunch and dead friendly and once when we went to see them Anthony was so giving me the eye. You can't see because it is dark, but he is really looking at me with come be my friend eyes. 1. 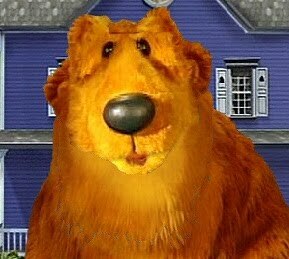 Bear from The Big Blue House. I know I am only encouraging him by talking about him again (if you don't know what I am talking about look and see how I have a TV Stalker) but I am thinking that maybe he isn't so bad after all... I mean look at that face with the puppy dog eyes and the little grin and the fur. And he has his own house. And he has made such an effort to follow me around, he tracks my movements during the day and then talks about me in code in his TV programme. I guess that a little reward for him wouldn't go amiss now would it! And now here are some taggings! So rules are name Five Fictional Characters you would get friendly with and tag five people. Just don't list the actors, as that is a different meme altogether! "You never let me go to the park when its been raining!" huffed an angry Top Ender. A bit later we were at Brent Cross shopping centre and decided before we went to the car, we would sneak into the local park to burn off some energy. Top Ender and Baby Boy (and Daddy and I!) enjoyed our play and it was just as we were starting to get ready to go that Top Ender started to get a little over excited. Top Ender ran off to go on the four sided see-saw (teeter totter) and slipped on the wet ground. "I guess this is why you don't want me going to the park when its been raining then!" Uncle Giggles - That's reassuring! Big Cousin had woken up after a nightmare which Auntie assumed had been about ladybirds as Cousin said there was one in her bed. Cousin was quite upset about it and so after a check in the bed and under the bed, and in Little Cousins bed and under Little Cousins bed, Auntie knew she was going to have to bring out the big guns and grabbed a bottle of talc. "Night night. Sleep tight. Don't let the ladybugs bite!" Don't take Uncle Daddy to the woods, he is strangely at home. Luckily a sleepy cousin didn't hear that last bit! That's right the third month of the 2010 and Easter is just around the corner! Hopefully by now you have brought your Easter Eggs or organised Easter gifts (if that is something you do in your house) and remembered last month after the February post to organise some treats for the Easter Holidays or childcare if it is needed! Last month I said that I was starting to save money more seriously for Christmas. Daddy and I are planning to save stamps in Tesco and Icelands (they do lots of wheat free ready meals which he likes) and I have started a card in Wilkinsons and one in Tesco's of my own! Every time I go into either store I just add a couple of quid to the relevant card and come Christmas I should be able to buy a few extras. 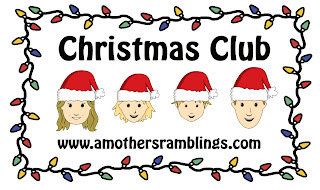 This month is about crafting for Christmas and I am looking to what I am making as gifts for Christmas. I want to make alphabet letter initial pillows for Baby Boy and Top Ender and for the Cousins (I will buy the pattern pack), and if I can manage them I was hoping that I could make some sock monkeys too! This will be an addition to the small gifts that my Sister and I will discuss nearer the time! I figured that the pillows would take me three months in total (I have a couple of tricky initials to do!) and the sock Monkeys two months as I would be doing them all by hand. If I start in April, this will bring me up to September. I have some cross stitch pictures to do (four of them) and I will start those now when I have a spare half an hour or so but in September I will re-evaluate where I am with them and if they aren't on schedule then I will have a re-think. The other things that are being made (gifts that I can't talk about because I know that my family are reading) are going to be made between September and November. So if you are planning on making gifts for Christmas this year, start thinking about it now so that come the week before Christmas you aren't rushing! As always if you do write a Christmas letter don't forget to make a short note now so you don't forget what you did this March! Top Ender didn't find it funny for some reason. Hello, Daddy here! Mummy has foolishly generously let me take over for a moment, to bring you a pearl of wisdom about the way men's minds work..
Back in 1999 I saw a Rover 75 car for the first time. It had quaint oval dials, a walnut dashboard, white leather seats, and a distinct air of old-man about it. Mummy liked it. I didn't. I couldn't buy a car like this. Fast-forward to 2007, and I am phoning Mummy to tell her about a decision I have made. She thinks I am asking permission to trade in my trusty, but old, Ford Fiesta for another car. At least, she did until I wrote this. She now knows that I have already done the deal, and I am hoping she doesn't say "no", else I have a heck of a lot of explaining to do. 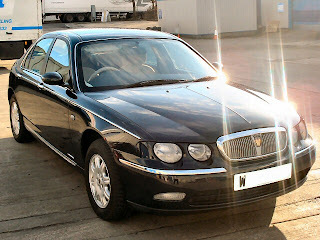 "Nice, isn't it" is the remark, as she takes a seat in my new Rover 75. "I've always liked these, and always wanted one. Thank you for letting me buy my dream car". The "Dream Car". Photographed just before we sold it! Only, those words were not uttered by Mummy. They came from me. Because in the intervening 8 years, I seem to have forgotten that I didn't like this car, and even more disasterously forgotten that she DID! Still, it couldn't happen again. "There", I said, putting the final screw in the shelf and switching on the power. "See this, it's a wireless music player - it's connected to my server in the loft, and it can play back all our MP3's and connect to Internet radio too. Trust me, it'll revolutionalise the way we listen to music in this house". "Oh yes, just like the one I told you I wanted after we saw it at the Smart Homes Show in Birmingham last year". "Like my new Psion Wavefinder?" I said, pointing at the glowing blue alien-shaped device on the window-sill that was burbling Planet Rock. "It's a DAB digital radio, but it's connected to the PC so you can....". I stopped. She already knew what it was. As she pointed out, she told me about them. Is it just me that this happens to, or is it in fact the case that men don't actually have any of their own ideas, they just store up the good ones that their wives come out with, only to promote them as their own later on, with a big fanfair and lots of kudos for themselves for coming up with such amazing plans!? So, in order to counter this, I am now learning two new things - 1, to listen to Mummy's suggestions properly and 2, to come up with loads more suggestions of my own first just so I can claim everything for myself. I think it's working. Me, last week: "I want to put a comfy armchair in that corner, with a footstool and lamp, so we can sit there and chill out"
Mummy: "Yeah, I cleared that corner for that exact reason 2 years ago, but then you put a bookcase in it". PPS. Editor's Note (by Mummy): No, he didn't. Look they are Baby Boy eye height. I did something the other morning that I haven't done since I was a grown up. I went round to someones house after school. Last week you see Chatty Mum invited herself round after Playgroup. The house was a tip, but I agreed because, well I like Chatty Mum. This week she invited us all round to hers. There were three of us that ended up going, all chatting together and having a giggle, talking about decorating and real life Jeremy Kyle stories and children's toys and goodness knows what else. It was only later that I realised that what I had just done would be the mark of a friendship. I mean you don't invite strangers into your home (well other than to read the Gas or Electric meters) and you don't swap stories about your life with someone you don't trust in some way. There is a rainbow in this picture... honest! Whilst I was pregnant with Top Ender I read about every single problem that could go wrong with the birth. I wanted to be prepared just in case. I wrote a letter to Top Ender and to Daddy that I hid in my underwear drawer just in case anything happened to me during the birth. I kept these morose thoughts to myself because Daddy is a natural worrier and I didn't need him knowing anymore than contractions start, baby comes out. Top Enders actual birth was quite normal. Well her cord was wrapped around her neck (which I knew as I could see on the monitor after every contraction her heart rate dropped a little and I told the Midwife that the cord was around the babies neck as the heart rate kept dropping but she told me it didn't mean that, but I could tell from the panic in her eyes I was right) but that was resolved without any hassle. I held Top Ender in my arms before passing her to Daddy as I was going to be stitched up, as I had a couple of small tears. A trainee midwife was going to do the work and she warned me that this may hurt more than the labour itself and that I should use the gas and air. It was at this point that she said that I wasn't using the gas and air properly and had basically just given birth without any pain relief. Take long deep breaths she said. As I took the deep calming breaths of the gas and air I could feel myself getting lighter, floating away from the pain and the bed that I was reclined on. I could see Daddy holding Top Ender, I could see the trainee midwife busy working and all I could hear were my own thoughts which were suddenly interrupted by a long high pitched beep. I suddenly realised that the monitor next to me was making the noise. Only one machine in a hospital makes a noise like this. The only time that you hear this noise is when a heart monitor is tracing your heart and your heart stops. The first thought that went through my head was that I had held my daughter before I had died and that her Daddy would look after her and love her for the both of us. I was so sad that I was going to leave Top Ender and Daddy behind but was so calm about it because I knew that they would be okay. I focused my eyes on them wanting them to be the last thing I saw before I died. It was now that I realised that I was taking an awfully long time to die and that neither the trainee midwife or Daddy seemed too bothered by my sudden lack of heart activity. I turned to look at the heart monitor next to me and then remembered that it wasn't a heart monitor it was a fetal heart and uterine contraction monitor. It was no longer monitoring anything and had decided to alert those around that there was no activity by emitting a long high pitched beep. The trainee midwife saw me looking at the machine and lent over and turned it off, whilst I put the gas and air tube down and braced myself for the rest of the stitches. After nearly dying a few stitches wouldn't be that bad. Baby Boy woke up with a grizzle. Being 5:30am and Sunday meant that Daddy got up to see him. I could hear a whispered conversation and then Daddy and Baby Boy appeared at the bedroom door. Baby Boy had a temperature and was still sleepy so he got in the bed with us for a bit of milk and hopefully some more sleep. It turned out that Daddy was also feeling ill, so I decided that I would give up my lay in (on Mothers Day too!) and take Baby Boy down stairs when he woke up. When Top Ender came down I realised that I was feeling a bit ill, with a headache and a sore throat and so I wanted to check that Top Ender was okay. Its Mothering Sunday today. Here in the United Kingdom we have linked this religious celebration with the holiday that Anna Jarvis really got going in the United States (and as always we have borrowed the idea!). Up and down the country Women are getting boxes of Chocolates, bottles of Wine, Plants, Flowers, Gift Vouchers, breakfast in bed, The Sunday Roast cooked for them (instead of by them) and possibly more than one of these things if the Television adverts are to be believed. I am lucky that I will have my family around me for the day and they will give to me hand made cards and a drawing or three. I believe they have listened to me and haven't purchased gifts for me because even though the calender says today is Mothers Day, every day in this house is Mothers Day. No this isn't a clever way of telling you I am pregnant, this is an old test! So to whoever you are Mother, Auntie, Grandma, Step-Mother, Friend of the Family or the woman who lives next door, Happy Mothers Day. 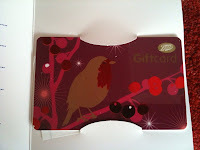 Daddy and I decided that we would give our Mums a Boots gift card each for Mothers Day. Whilst I was busy in another part of the store Daddy went to buy our gift cards. 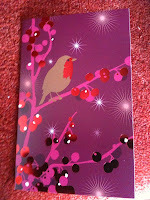 The female shop assistant passed Daddy a box of cards, so that Daddy could choose the one that he wanted. Daddy flicked passed the ones that said Happy Birthday and Congratulations and discovered two with a pretty bird picture on. That's right. Daddy choose Christmas gift cards. There is a song that Top Ender and I heard in Sponge Bob Square Pants many moons ago. It was a song that straight away caught our imaginations and we had to go and learn the words to. We learnt them very quickly and will quite often start singing the chorus at appropriate moments. Last weekend as Daddy and I went to bed we both spoke to each other just telling each other that we had had the best weekend ever. Both Baby Boy and Top Ender were on fine form, we had a good giggle at Daddy when he went to a meeting an entire week early and we had some good food too. So because I expect this weekend to be just as good here is our song for you all to enjoy too! edited to use new video! Today I should be posting my blog post about my trip to London last week and how I met lovely bloggers and how I ate Nestle Cereals... but I'm not because its not quite right with what I want to say and so here is a very very short story. And the lady entered it in to a competition. In fact you can read all about it in An Instructional Video. The most amazing thing happened, the lady (alright me) found out that she was in the Top Two and so she asked all her friends to vote for her at Cafe Bebe (vote for A Mothers Ramblings) so that she could win a Slanket so that she and Top Ender wouldn't have to share one anymore. And all her friends voted for her and they felt loved, because the lady told them she loved them. Wordless Wednesday - But I was following you! So Karin at Cafe Bebe and Heather at Notes from Lapland said "Teach us Something" in a Vlog and we'll run a competition and then one of you will win a slanket. Now the last Slanket that we got was one that we won at Sleep is for the Weak and since it arrived it has lived in Top Enders room (unless I have wrestled it from her to use whilst sitting on the sofa to watch my grown up programmes that I sometimes have to hide in the Slanket from) or on the back of the sofa... so if I am lucky enough to be chosen as one of the two finalists vote for me in order to save family harmony by letting Top Ender and me have a Slanket each! Now go and try this out, before you forget how to do it! Whilst watching Grease Top Ender made a comment that you can rely on your Dad and your Brother (After Frenchy told Sandy you can only rely on your Dad), but that they wouldn't know that as they didn't have a brother but she did. "Because I don't like cool and I am helping to raise him." she stated. The day I met famous people and ate Nestle! Before we start this post, let me just explain that this is a Sponsored post, but that the views expressed are my own! You see I had been invited to an event in an area of London I didn't know too well (but looked up on Google Street View) to talk to some celebs about the Nestle Cereal Partners campaign about getting families to eat more wholegrain. A few days later Laura from Are we nearly there yet Mummy? sent me a Message on Twitter asking if I was going to the Nestle Event. I replied back that I was and also that we were going to be kidnapped. I kind of got excited that I was going to be kidnapped with Laura... I can't help but feel that she didn't feel the same for me. I think I came on too strong. As we pulled up to where we were having the event I bumped into the beautiful Nataliya from Suburban Mummy UK with her very lovely children and we walked in together. Unfortunately she also ran off from me saying that it was so she could take Eliza and Jeremiah to the toilet. I guess I came on too strong again there too. Luckily for me Laura was just finishing making muffins with Lesley Waters and so she and I chatted for a few minutes before Greg Searle (you know the good looking rower Go Team GB!) was introduced to us. I am ashamed to say that I didn't recognise him as being a Rower as I was far too interested in just looking at him... but that's enough of that as Daddy is reading the blog and maybe Greg Google's himself every so often and I don't think he wants to read about what I was thinking. Anyway I got chatting to Nutritionist Juliette Kellow about bits and pieces next and asked her lots of questions about wholegrain diets, getting five a day, eating cheaply by eating seasonally, protein, oily fish and all the other questions that I had about my families diet and she told me a lot about the benefits of eating a wholegrain cereal for breakfast or as part of a meal and pointed out that the Nestle Green Tops on the cereal boxes is a handy visual reminder for knowing that the Nestle cereals are wholegrain. I then managed to talk to Sally of Who's the Mummy fame (who had Flea with her) and Susanna of A Modern Mother fame and briefly to Nixdminx and they were all very lovely and I suddenly wondered why the heck I was there compared to these five fantastic other Bloggers, but I couldn't bring myself to ask just in case they realised they had made a mistake and threw me out of the very lovely kitchen! Leslie Waters was next to chat to me, which we did for ages. We talked about making wheat free goodies for Daddy and Top Enders current dream of being a chef when she is older (well its now changed back to being a Fashion Designer) and again I got some great tips! I was a bit gushy with Leslie (but she took it all in her stride) and I told her that my Nan loved her (and so did I) and in return she recorded a video message to my Nan which my Nan was chuffed about! I then got some time with one of the greatest women on earth the wonderful Annabel Karmel. I have loved her books for so long (I have five!) and Top Ender, Baby Boy and I love to make several dishes from them and I even told her about the Salmon Fishballs that we love to make! I did try to persuade my taxi driver that he wanted to take me home in her car but he said that one day I would be rich enough to buy my own. I liked that taxi driver. I had a brief chat with Zoe Ball (who is really tall and really pretty and super skinny) and thought that I might change my ideal look from Audrey Hepburn to Zoe Ball... I mean I have met her husband and everything so you know we are like the same person already! Anyway when I got home the very lovely Muffins that Leslie Waters had made were eaten by Baby Boy. And here is how to make them! 1. Preheat the oven to 200oC/fan 180oC/400oF/gas mark 6. 2. Lightly oil 9 cups of a muffin tin or line with muffin paper cases. 3. Crumble the Fruitful Shredded Wheat biscuits with your hands. 4. Sieve the flour and baking powder into a bowl. Stir in 55g of the crumbled Shredded Wheat biscuits, 20g of the Fruitful fruit mix and the sugar. 5. Whisk together the milk, egg and oil. 6. Mash the bananas and fold into the dry ingredients with the milk mixture. 7. Gently mix in 75g of the blueberries. Do not over mix. 8. 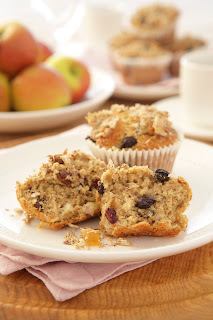 Divide the mixture between the muffin cups/cases, not quite filling them. Top with the remaining blueberries and scatter over the remaining 25g of crumbled Fruitful Shredded Wheat biscuits. 9. Bake for 20 minutes until golden, risen and firm. Leave for a few minutes then transfer to a wire rack to cool. • You can replace the blueberries with other berries such as blackberries, raspberries and loganberries. I am one of *those* Mothers. You know the ones that bake cakes with the children and say it was fun. One of those ones that make their children dressing up costumes even when there isn't a party or school event. Well I know who she is supposed to be. One of those ones that turn shopping into learning experiences. One of those ones that read books to their children that they want to read but are just too young for. One of those ones that make paper plate faces. One of those ones that make paper plate cafe food. One of those ones that spend hours searching the shops for a special ribbon. See that Gold present there with the rainbow ribbon? Yeah hours that one took. One of those ones that saves toilet rolls and asks others to save them too so she can build a castle. One of those ones that spends Friday night watching a film with the children. One of those ones that knows what is going on at school. One of those ones that talks to their child and the child talks back. One of those ones that I didn't ever want to be but it turns out I am and I wouldn't have it any. other. way. With thanks to Chatty Mum and Fashion Mum for pointing out I was one of *those* Mums last Thursday! Daddy and I were talking the other day about our Princess Dancing and about how we both want Top Ender and Baby Boy to have memories of us being fun, to have memories of us doing things together as a family and for us to set a great example to them for when they have families of their own. Both of us have treasured childhood memories that we have made sure we have our own version of with Top Ender and Baby Boy and of course new memories special to just us four. Everything we do we try to make fun. It might be eating Chinese with chop sticks (one of my memories), sneaking snacks into bed (one of Daddy's), going for walks in the countryside, family dinners, spending quality time with one parent or even surprise trips out for the day as a family. Daddy was explaining that he was pleased that we do fun things like the Princess Dancing and going to the Hundred Acre Woods and that I record them and share them on the blog. He has mentioned several times how some people ask him what he did at the weekend because what we do is always exciting compared to what they did. And so it I thought that maybe Daddy should start writing the odd post or two... and I suggested it to him and he agreed! So before this month is out there is going to be a post by Daddy. Please make him feel as welcome as you do me and just don't let his head get too big. Oh and talking of Princess Dancing, it turns out that I won! Thank you to everyone who voted or mentioned me and so I won't feel guilty about showing you all and getting the "aaahhh" factor votes here is Princess Top Ender and Prince Baby Boy doing their version of Princess Dancing. "Well not you, people in general..." he quickly clarified. Better stop digging now Daddy. Wordless Wednesday - Best Marketing ploy ever! What did I learn in February? I learnt that I need to learn when to keep quiet. Actually no, I learnt that I need to learn when not to leave comments on blogs and then to follow my comments up in Twitter. The Internet is forever don't you know? You see it all started the other day when I was reading Living with Kids and there was a great post about the British Dance Council and Disney supporting each other with the creation of the Disney Princess Dance. It is all about encouraging our children to get active and as we all know we should lead by example! "I am so going to vblog this!" So here is my entry (with a little help from Daddy.....) into the Living with Kids Princess Dance Challenge... and if you want to see the competition I'm up against then take a look at Karin at Cafe Bebe and Manda at Flying Start who have also filmed themselves dancing to this. Unless, of course, they were lying and its just me. Top Ender Giggles - There's only one way to find out! Top Ender was in the car with Daddy and were talking about taking lessons to learn an insturment when she is in year two. We are going to have to stop Top Ender watching TV.